Mark Levin, Monica Crowley, Ken Cribb, "Joe the Plumber," Andrew Breitbart, Ed Meese and a performance by the Capitol Steps highlighted the MRC's "2009 DisHonors Awards: Roasting the Most Outrageously Biased Liberal Reporters" presented on Thursday night, March 19 , before an audience of more than 800 in the Independence Ballroom of the Grand Hyatt hotel in Washington, D.C. Following the presentation of the DisHonors Awards videos in four categories, a look at some "funny clips" from 2008 and the audience picking Bill Maher for the "Quote of the Year," MRC President Brent Bozell honored Brit Hume with the MRC's third annual "William F. Buckley Award for Media Excellence." Hume recounted a humorous anecdote about Buckley before predicting the decline of newspapers could lead to a return to an overtly partisan press and thus plenty of work for the MRC. Brit Hume accepts the "William F. Buckley Award for Media Excellence." Bozell served as Master of Ceremonies. Monica Crowley, a nationally-syndicated talk radio host and panelist on the McLaughlin Group, presented the first two awards as well as clips of interviewers fawning over Barack Obama; followed by Intercollegiate Studies Institute President Ken Cribb who set up the funny clips. National talk show host and author Mark Levin handled the third and fourth awards. The program begins with an "Obama Gospel" parody video before Brent Bozell makes opening remarks. In place of the journalist who won each award, a conservative accepted it in jest. Those standing in for the winners: Andrew Breitbart, Joe Wurzelbacher, a medley of parody songs by the Capitol Steps and Ed Meese. The evening began with welcoming remarks from Bozell, an invocation by Father John De Celles and the Pledge of Allegiance led by COL. Jay Stobbs USA Ret. Monica Crowley Presents the "Media Messiah" Award. Andrew Breitbart Accepts "Media Messiah" Award. Keith Olbermann: "For 42 minutes, not a sour note and spellbinding throughout in a way usually reserved for the creations of fiction. An extraordinary political statement. Almost a fully realized, tough, crisp, insistent speech in tone and in the sense of cutting through the clutter....I'd love to find something to criticize about it. You got anything?" Chris Matthews: "No. You know, I've been criticized for saying he inspires me, and to hell with my critics!...You know, in the Bible they talk about Jesus serving the good wine last, I think the Democrats did the same." MSNBC live coverage of Obama's Democratic convention speech, August 28, 2008. "In many ways, it was less a speech than a symphony. It moved quickly, it had high tempo, at times inspiring, then it became more intimate, slower, all along sort of interweaving a main theme about America's promise, echoes of Lincoln, of King, even of Reagan and of Kennedy....It was a masterpiece." Co-anchor Chris Matthews: "I have to tell you, you know, it’s part of reporting this case, this election, the feeling most people get when they hear Barack Obama's speech. My — I felt this thrill going up my leg. I mean, I don't have that too often." Matthews: No, seriously. It's a dramatic event. He speaks about America in a way that has nothing to do with politics. It has to do with the feeling we have about our country. And that is an objective assessment." The Capitol Steps Accept the "Half-Baked Alaska Award for Pummeling Palin"
"The fact of the matter is, the comparison between her [Sarah Palin] and Hillary Clinton is the comparison between an igloo and the Empire State Building!" "[McCain has] done it [picked Sarah Palin] at great cost, because the whole Republican convention...was going to be the slogan, 'He's not ready to lead,' meaning Barack Obama. Well, Sarah Palin makes Barack Obama look like John Adams. I mean, it's just, it's no contest." "You know, the one thing that I don't think anybody's said yet is that she's very mean to animals, this woman. Why does she have it in for these poor polar bear and the caribou and she aerial kills wolves? That's a very mean thing to do. I think that that's an important point." "I'm not that convinced that that's her baby....The daughter — who we know is fertile because she's knocked up again, or maybe for the first time...she did like take a five-month leave from high school because she had [uses fingers to indicate quote marks] 'mononucleosis' right around the time the baby was being born. And the mother, the so-called, you know, okay, maybe it is the mother, but, you know, she was back to work three days later. You don't smell something?...It's not like they're not willing to lie about everything else." Monica Crowley Presents the "Obamagasm" Award. Joe "the Plumber" Wurzelbacher Accepts "Obamagasm" Award. "Today, the audacity of hope had its rendezvous with destiny. No mere endorsement this, more like a political anointment from the Kennedys, merging ideals from two different eras....Obama is now an adopted son of Camelot. His candidacy blessed not just by the Lion of the Senate, patriarch of the clan, but by JFK’s daughter." "You've seen those videotapes of Walter Cronkite the night that man landed on the moon for the first time, when Neil Armstrong stepped out and he could just barely get out monosyllables. Politically, that’s what this is. This is man on the moon." "We know that wind can make a cold day feel colder, but can national pride make a freezing day feel warmer? It seems to be the case because regardless of the final crowd number estimates, never have so many people shivered so long with such joy. From above, even the seagulls must have been awed by the blanket of humanity." Mark Levin Presents the "Dan Rather Award for Stupidest Analysis." Ed Meese Accepts the "Dan Rather Award for Stupidest Analysis." "What do you think the bigger obstacle is for you in becoming president, the Clinton campaign machine or America's inherent racism?" "And now to our series, Global Warming: Global Warning. Could global warming one day force us into space to live?" "Many Americans drive private cars not much smaller than this truck, and the risk is that they use their tax rebate simply to buy fuel, boosting the profits of the oil companies but doing little or nothing for the wider American economy." "Not doing it [fighting global warming] will be catastrophic. We'll be eight degrees hotter in ten, not ten but in 30 or 40 years, and basically none of the crops will grow. Most of the people will have died and the rest of us will be cannibals. Civilization will have broken down." Bill Maher earned the "Quote of the Year" distinction as voted by the audience. After attendees saw all the videos in the four categories, MRC President Brent Bozell invited the presenters and acceptors back on stage (Monica Crowley, Mark Levin, Andrew Breitbart, Joe Wurzelbacher and Ed Meese) to assess audience reaction to each of the winning quotes from Chris Matthews, Bill Weir, Bill Maher and Ted Turner. The videos were re-played and then, as a picture of each nominee was displayed, audience members were asked by Bozell to hoot, cheer and applaud to express their opinion on which quote deserved the Quote of the Year designation as the worst bias of 2008. It was a close call between two of the quotes, and so the judges asked for a run-off between Chris Matthews' "thrill going up my leg" and Bill Maher's looney conspiracy theorizing about how Sarah Palin's baby was really born to daughter Bristol. Joe Wurzelbacher then stepped forward to announce Bill Maher as the winner. 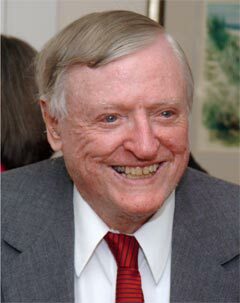 William F. Buckley Jr. (1925-2008) is the intellectual cornerstone of the modern conservative movement. His founding of National Review magazine in 1955 provided the home base for conservatives in an America seemingly overrun by liberalism. With NR, and as host of television’s Firing Line for 33 years, William F. Buckley Jr. spread the cause, helped rally conservatives during the Cold War, was instrumental in helping Ronald Reagan win the presidency — twice — and continues to provide the intellectual ammunition, along with grace and wit, to strengthen conservatives in the on-going battles to preserve liberty, peace and justice in America. In addition to NR, Mr. Buckley has written 40 books, publishes a regular column syndicated to 300 newspapers, and pens longer articles for magazines and other outlets. He has educated and inspired thousands of conservatives, especially young men and women, through his articles, books and TV appearances. These young conservatives have followed Mr. Buckley’s example and relayed the conservative message across the country and through various media, particularly the New Media: cable TV, talk radio and the Internet. Fifty-nine years ago, William F. Buckley Jr. circumvented the liberal media’s "Berlin Wall" of bias with imagination and tenacity. His intellectual progeny now populate the airwaves and cyberspace, leaving the old liberal media in the dustbin of history. To recognize and honor the very best of these new conservative leaders, the Media Research Center is proud to announce the annual William F. Buckley Jr. Award for Media Excellence. L.Brent Bozell Presents the William F. Buckley Jr. Award for Media Excellence to Brit Hume. Brit Hume Accepts William F. Buckley Jr. Award for Media Excellence. The mission of the Media Research Center is to create a media culture in America where truth and liberty flourish. The MRC is a research and education organization operating under Section 501(c)(3) of the Internal Revenue Code, and contributions to the MRC are tax-deductible. Copyright © 2016, Media Research Center. All Rights Reserved. Dummy Text - Overwitten by JQuery.